The Lakers have suffered losses at a franchise record pace. Their defense has become a non-threatening punching bag that enable both stars and no-name players alike to post career numbers. And the Lakers have failed to offer any consistent signal on when it will all stop. Yet, one variable has still ensured the Lakers attracting strong interest from fans and media alike. The reason, of course, involves Kobe Bryant, who has posted a league-leading 25.2 points after appearing in only six games last season because of injuries to his left Achilles tendon and left knee. Within that storyline emerges another interesting subplot. 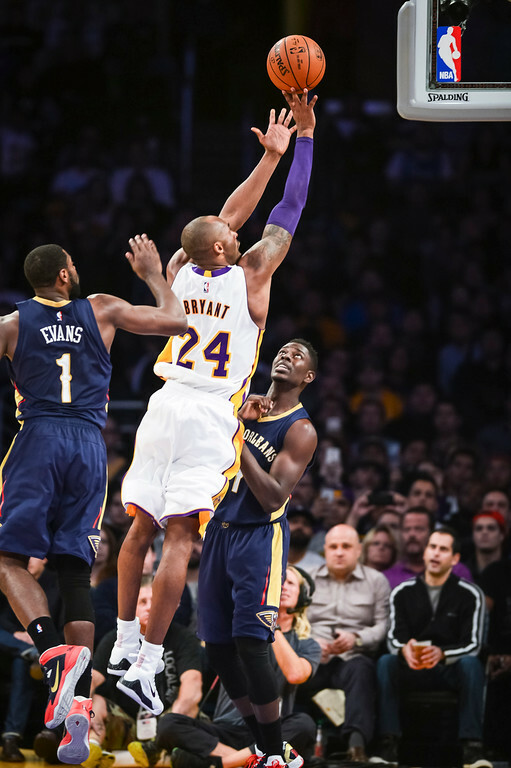 Bryant enters the Lakers’ (5-16) game on Tuesday against the Sacramento Kings (10-10) at Staples Center only 62 points away from surpassing Michael Jordan for third place on the NBA’s all-time scoring list. Bryant has actually maintained public stoicism about his career 32,230 points nearly surpassing Jordan’s 32,292 points despite listing him as one of significant idols growing up. But Abdul-Jabbar’s perspective comes from experience. He has remained the NBA’s all-time leading scorer with 38,387 points, while Karl Malone has trailed second with 36,928 points. Abdul-Jabbar lasted 20 NBA seasons for reasons involving his patented sky hook, footwork and dieting. He also played 30 minutes per game in his last seasons. Abdul-Jabbar’s contributions in the 1987-88 season (14.6 points, 6.0 rebounds) and 1988-89 season (10.1 points, 4.5 rebounds) marked a steep drop from his career averages of 24.6 points and 11.2 rebounds. Bryant remains under contract through the 2015-16 season, though Lakers coach Byron Scott recently said publicly that he hopes Bryant extends his career for at least another year. Regardless, it appears unlikely Bryant could surpass Abdul-Jabbar given the vast point differential. This entry was posted in Kobe Bryant by Mark Medina. Bookmark the permalink. Zach Henderson on Did you have Senegal plus 46?